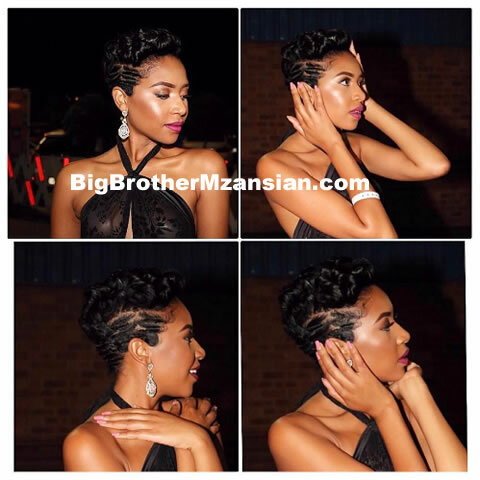 When short hair looks this good it has got to stay forever. You know that feeling when your hairstylist gives you more than what you had expected? 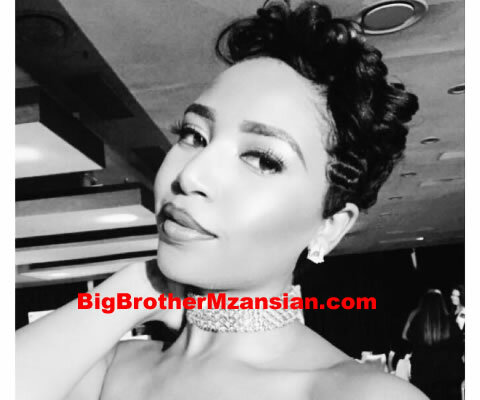 We're sure this is exactly how Former Big Brother Mzansi housemate Thandi 'Blue' Mbombo felt after her hair dress was done with her short-hair transformation. Blue's short hair is worthy of writing about. 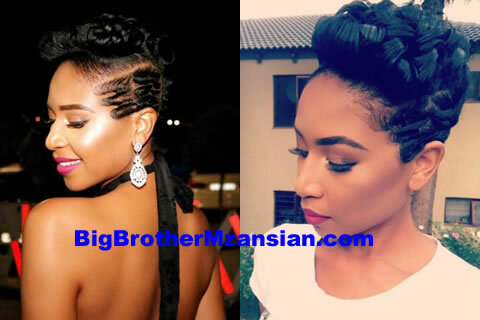 Maybe it is the complexity of it, maybe it is because it frames her face well or maybe it is because the lady that is rocking this haircut is Blue Mbombo. Whatever the reason, we love it. Blue just has the right attitude and style for her new look. Just look at that pose and confidence. Yes girl! 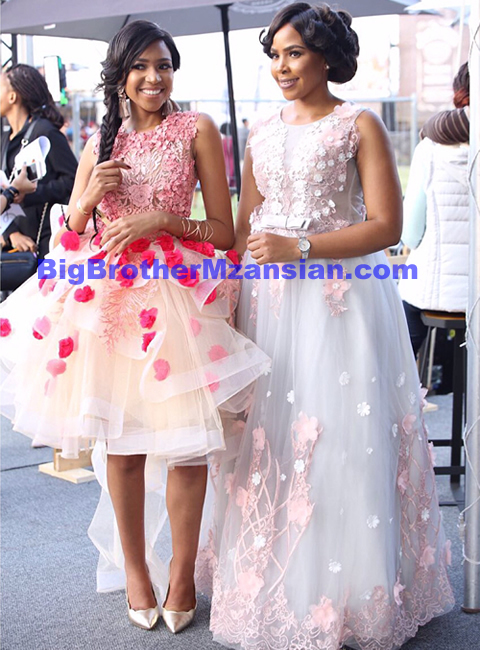 Beauty queen and reality TV star Blue Mbombo together with her lovely twin sister Brown Mbombo are celebrating their birthday today. The cuties have added yet another year to their age as they were born on the 15th of December. 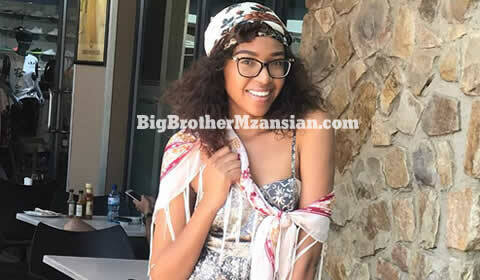 A happy Blue Mbombo took to Image-sharing website Instagram where she shared the good news of her birthday with her fans and followers. Blue posted a picture in which she's seen with her twin sister Brown donning black outfits while they play around with balloons. “Happy Birthday to my fraternal twin, wombmate and favorite person in the whole wide world!!!!! (and yes, this means its my birthday, too!) Every year on this day, I get to reflect on how blessed I am to have a lifelong, built-in best friend from birth. Ruth 1:16-17 "But Ruth replied: Do not persuade me to leave you or go back and not follow you. For wherever you go, I will go, and wherever you live, I will live; your people will be my people, and your God will be my God. Where you die, I will die, and there I will be buried. May Yahweh punish me, and do so severely, if anything but death separates you and me." 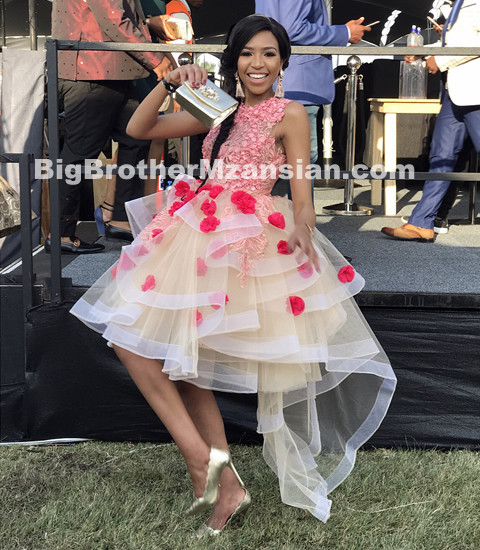 I love you Twinnie @brownmbombo and happy birthday”, she wrote. 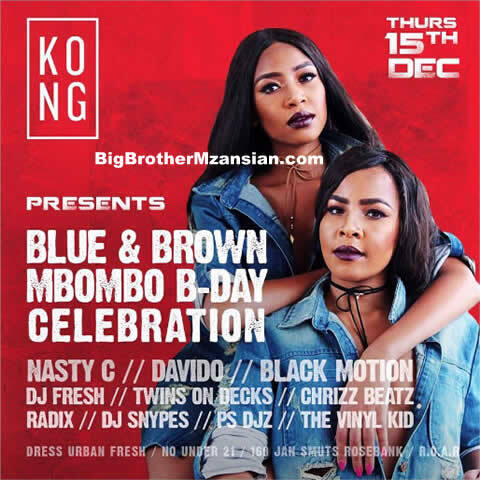 The twins will be celebrating their birthday at KONG night club with performances from Nasty C, DJ Fresh and Davido among others. So please make it a point to be there. 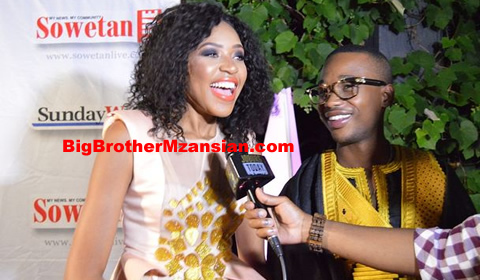 The entire Team at BigBrotherMzansian Wishes BLUE MBOMBO & BROWN MBOMBO a Happy Birthday!!! 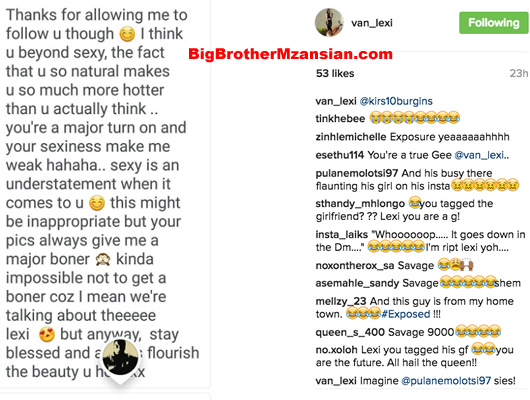 If there's one thing we commend Lexi for, it's her honesty and no-holds-barred clap backs, especially if you come for her sideways. 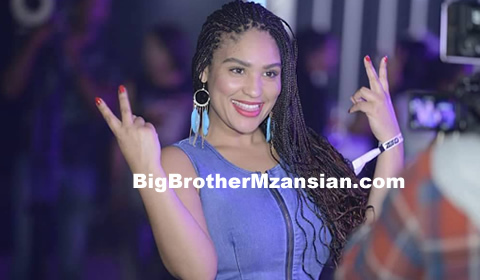 The former Big Brother contestant and reality star has warned all the perves out there to stop D.Ming her sexually provocative messages on social media after one of her followers thought he could get fresh with her. Lexi made an example of the man after she screen-shot all of the dirty D.Ms he had been sending to her. 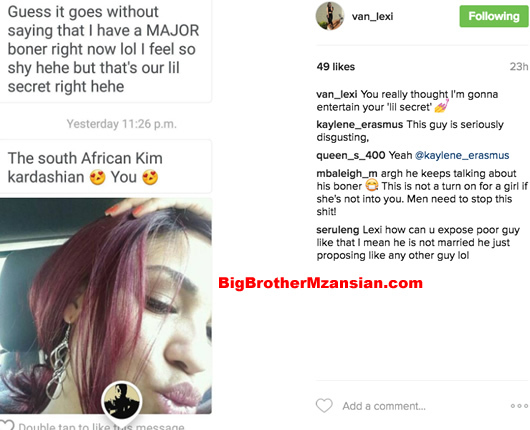 Lexi clearly had enough of the man's thirst and took a second screenshot of the man's messages to her. 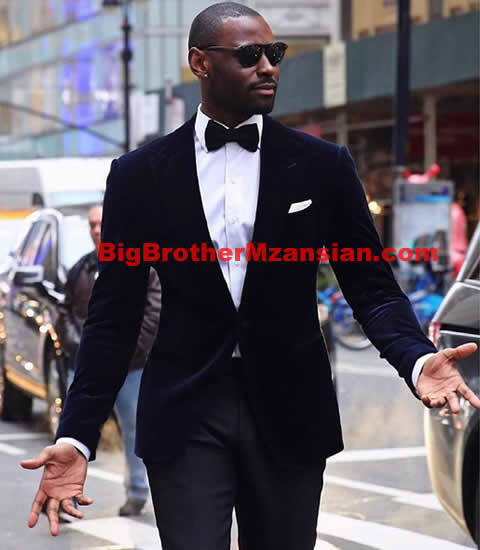 After seeing the screenshots she had posted up on her Instagram, the man sent countless of apologetic messages begging for Lexi to take the screenshots down as it will ruin his current relationship.....tjo! Why are you sending another woman thirsty messages in the first place if you're already in a relationship Pah? 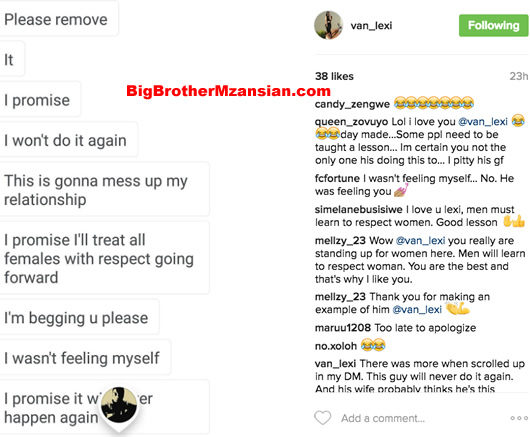 After posting the screenshots, Lexi then left a video message for all you thirsty men and woman out there. 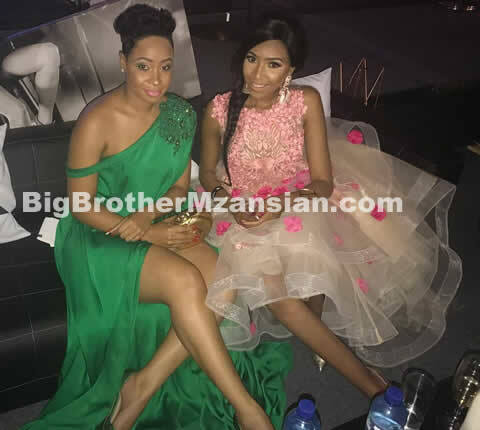 In the video, Lexi shares how she's not here to entertaining people's D.Ms. "This is a note for all the guys who are just...or attention seeking, listen I'm not one of those girls who are just going to entertain your D.Ms so before you hit up my D.M make sure that it's clean and it's of positive notes. 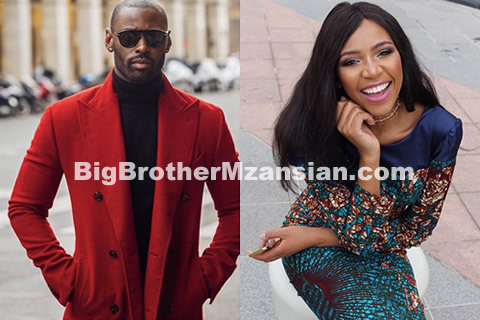 Don't come and be f**** horny here...."
Lexi also warned the ladies about them also sending D.Ms to her boyfriend, former Big Brother Mzansi winner - Mandla. 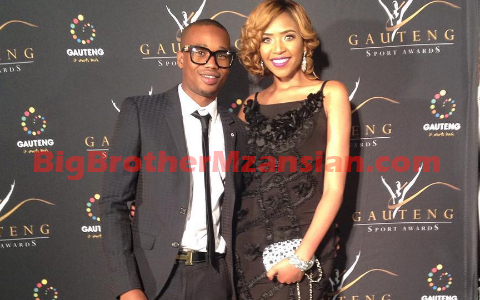 Ayeye, guys please control your thirst, you'll ruin your relationships and get exposed out here.